Immigrants from Italy first settled in the Five Points neighborhood in the 1850s, spreading north into what is now Little Italy in the 1880s. The Five Points was New York's original and most notorious slum. Located at the southwest corner of what is now Columbus Park — a few blocks below Canal at Baxter Street — the district teemed with gangs, prostitutes, criminals and street urchins. A target for reformers of all stripes and an embarrassment to civic planners, the dark and airless tenements of the Five Points. By the close of the nineteenth century, New York City boasted several Italian enclaves. Northern Italians settled in Greenwich Village and what is now Soho; southern Italians — particularly Neapolitans, Sicilians and Calabrians — populated Little Italy. To some extent, the location of Italian immigrants even reflected specific street preferences: Mulberry Street, for example, largely housed immigrants from Napoli, while Elizabeth Street housed Sicilians. By some accounts, the first pizzeria in New York was Gennaro Lombardi's, which opened on Spring Street in 1905 (and reopened in 1994 just down the street from its original location). Immigrants from southern Italy first celebrated the Feast of San Gennaro along Mulberry Street in about 1926. A small but notorious minority of Italians formed crime syndicates modeled on secret societies in Italy. Infamous Manhattan, a walker's guide to the island's history of crime, dedicates an entire chapter to describing murder and mayhem in Little Italy, Chinatown and the Five Points. 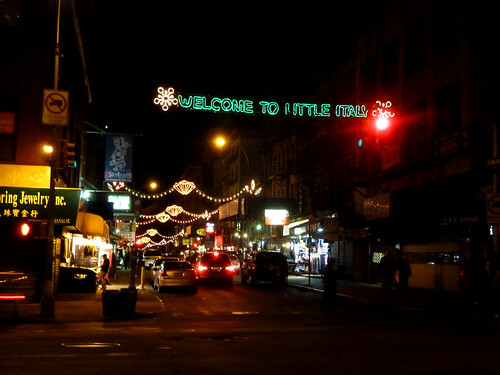 As it relates, Little Italy may have been the birthplace of the Mafia in the United States; it was undoubtedly the mob's favorite stomping grounds. Umberto's Clam House, then at 129 Mulberry Street (corner of Hester), was the site of Little Italy's most famous mob hit. At 5 a.m. on April 7, 1972, three gunmen smashed through the restaurant's side door, shooting Joey Gallo, a maverick mob leader. Gallo, hit three times, staggered outside and collapsed in the middle of Hester Street. As the saying goes, "he ordered clams but he got slugs." Until recently, 247 Mulberry (just below Prince), was the site of the Ravenite Social Club, a longtime Mafia hangout. Most notoriously, John Gotti — the Dapper Don — was arrested there on December 12, 1990, and charged with racketeering and murder. Even though the Ravenite's facade had been bricked up to evade FBI surveillance, the Feds managed to bug the building and record enough evidence to prosecute Gotti, who is now in prison for life. A sign of the times: the ground floor's brick facade was recently replaced with a shiny glass storefront, and a boutique has opened. From the south, Little Italy has lately been colonized by Chinatown; its northern reaches now host fashionable boutiques, bars and restaurants. What remains of the visibly Italian side of Little Italy largely centers around Mulberry Street, with its numerous cafes and restaurants. The area's many excellent bakeries, including the Parisi Bakery on Mott Street, are another indicator of its Italian heritage. The Feast of San Gennaro is a large street fair, lasting 11 days, that takes place every September along Mulberry Street between Houston and Mosco Streets. In 2010, Little Italy and Chinatown were listed in a single historic district on the National Register of Historic Places.